Store these tomatoes in a jar covered with olive oil, use a lemon olive oil if desired. For a quick appetizer see below. Preheat the oven to 350∫F. Arrange the tomato halves cut side up and close together on a baking sheet. Season with salt and pepper. In a bowl, combine olive oil, garlic, and herb. Drizzle over tomatoes and bake until the tomatoes are soft and shriveled but still retain some moisture, about one hour. Let cool completely. Tomatoes can be stored in a glass jar, cover tomatoes with olive oil, seal and refrigerate. For sauce: Process in a food processor and warm in a large saute pan. 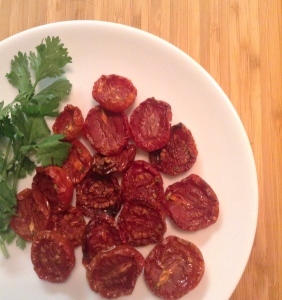 For a quick appetizer, stuff roasted tomato halves with the following. Mix together 1 log of goat cheese, 2 Tb. fresh chopped herbs and 1 -2 Tb. of heavy cream. Mix until goat cheese is soft but not runny. Spoon or pipe herbed goat cheese onto dried tomato, serve with a drizzle of aged balsamic vinegar.